Remembering Prof. Allan Tough (died 27 April 2012 aged 76 years) – a great man, a pioneer researcher into self-directed learning, a futurist, and author. Allen’s research was fundamental to 70:20:10 thinking. During the past 6 weeks I’ve had the pleasure of working with representatives from more than 60 organisations in a series of master classes identifying ‘quick wins’ and developing action plans for implementing the 70:20:10 framework. In fact, over the past few years I’ve had the opportunity to work with many other organisations – from huge multinationals with hundreds of thousands of employees across the world, to small and medium-sized enterprises and regional government departments – all organisations that are exploring the best ways to deploy the 70:20:10 framework, or are actively making it work. 70:20:10 is not about a fixed ratio. It’s a simple and extremely helpful framework for changing focus and aligning resources to support workforce development and learning with where most of it already happens – in the workplace. So, why use ‘70:20:10’ at all? The numbers are a useful reminder that most learning occurs in the context of the workplace rather than in formal learning situations and that learning is highly context dependent. The numbers provide a framework to support learning as it happens through challenging experiences, plenty of practice, rich conversations and the opportunity to reflect on what worked well and what didn’t. It’s also useful to keep the ratios in the back of our minds to remind ourselves that learning naturally occurs this way. They’re not some tight formula that organisations should be targeting. It’s well worth reading my Internet Time Alliance colleague Jay Cross’s article about formal/informal learning ratios on his Informal Learning blog. Jay makes clear something we all know deep down - that learning is not a binary process – it usually doesn’t happen exclusively formally or exclusively informally, but mostly part-formally and part-informally. The mix varies depending on the situation. I’ve also stressed this point in my ‘70:20:10 Learning Approaches’ presentation on SlideShare. The KPMG work with the global food manufacturer, Sara Lee, cited on the Informal Learning blog, provides a good example of the fact that the ratios will vary with specific situations and therefore shouldn’t be taken as a mantra. One thing I do know from working with many organisations using the model is that The 70:20:10 framework is an extremely helpful change agent. One of its most powerful uses is to provide a structure for de-focusing time and effort on sub-optimal away-from-workplace training and re-focusing on more efficient and effective types of development. Almost without exception in my experience organisations that have adopted 70:20:10 have achieved greater impact on performance at organisational and individual level at lower cost than was being achieved beforehand. Recently I’ve seen variations on the numbers being put forward. Some of these ideas are the result of thoughtful and useful analysis. Others are ‘angels dancing on heads of pins’. It would be an exercise in futility to re-define the Sara Lee data above as the 45:30:10:8:3:2:2 model. My own view is that as social media comes into more ubiquitous use in workforce development – from executive and leadership development to individual contributor functional development - the ‘20’ will strengthen at the expense of the ‘10’, so we may get to a time when the ‘70:20:10’ just doesn’t make sense anymore and we’ll need to find some new way to express the need for change. However, I think that we’ve some way to go before that point is reached. Organisations that succeed in deploying the framework are those that understand the need for adopting a clear strategy, but then focus on practical ‘low-hanging fruit’. This top-down and bottom-up approach is essential. Clear direction plus senior stakeholders who are engaged, enrolled and prepared to act as ‘champions’ will get the change process underway and keep it on track, but then HR and learning professionals who can identify the quick wins and achieve them are also critical to ensure that change happens on the ground. Simple things such as embedding 70:20:10 concepts into annual development planning and templates, educating workers and their managers that ‘development’ does not equal attendance on programmes and courses, ensuring that social learning and reflection is embedded into work practices, all contribute to the change process. The thinking that hard-wires ‘knowing’ to ‘learning’ has set our efforts to build high-performing organisations back many years. Learning and knowing sometimes coincide, but they are different beasts. There is still a huge focus on ‘knowing’ in organisational learning. We build formal classroom courses and eLearning programmes that consist of pre-tests and post-tests. We then assume that if we gain a higher score after some formal learning process (almost invariably assessed through a test/examination/certification based on knowledge recall) than we did before, then learning has occurred. Most of us know deep down that this is bunk. Passing knowledge tests immediately following a course tells us little about real learning. It may tell us something about short-term memory recall, but real learning can only be determined by observable long-term changes in behaviour. The 70:20:10 framework, with it's emphasis on learning through experience (the ‘70’ and ‘20’ bits, especially), helps push the understanding of what learning means towards ‘know-how’ from ‘know-what’. Towards demonstrating learning through action – behaving differently when confronted with specific circumstances. Morgan McCall, one of the researchers who carried out the Centre for Creative Leadership survey of managers that led to the 70:20:10 framework becoming more widely known and adopted, explains the power of experiential learning here. 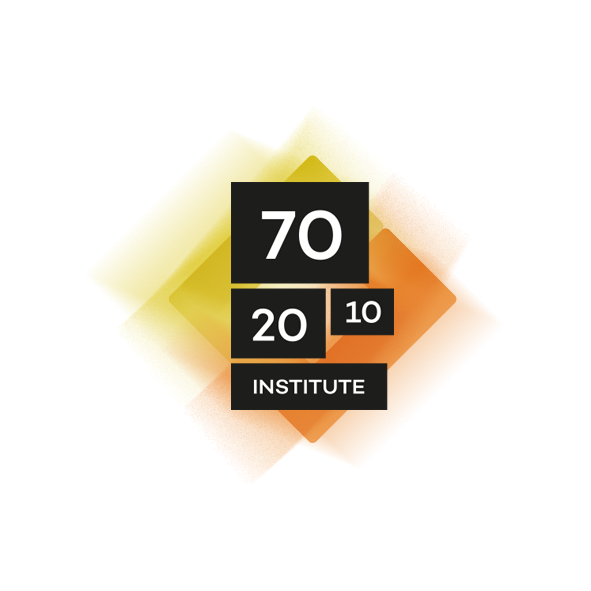 Organisations that effectively incorporate the 70:20:10 framework into their workforce development strategies invariably build a wider understanding of what ‘learning’ means – and follow that up with empowering many people to think of learning opportunities outside the class/curriculum mind-set. 70:20:10 implementation challenges entrenched learning and development practices and, in so doing, puts pressure on quite a number of learning professionals. It does this because one of the underpinnings of the framework is the acceptance that only a small percentage of organisational learning (the ‘10’) can be managed by the HR and L&D departments. The vast majority occurs outside their bailiwick. The categorisation below, developed with my Internet Time Alliance colleagues Jane Hart and Harold Jarche, shows clearly that most ‘informal’ elements of learning can’t be managed, but can only be supported by HR/L&D. Others can only serve as lessons themselves. So, a precursor for effective implementation of the framework is for learning professionals in the organisation to let go trying to control everything and look instead to support, encourage and learn from the learning that is happening all around them. This is not to say learning professionals are necessarily redundant. However it does mean that they need to step up to challenges that they probably haven’t faced before and change their modus operandi from simply designing, developing and delivering formal learning activities and programmes. Effective deployment of 70:20:10 usually requires significant support for line managers – as they’re the people who have the most influence over effective implementation of the ‘70’ and ‘20’ (and the most influence over learning and performance improvement generally). The L&D staff can play an important role in supporting line managers to identify, enable and encourage social learning, information sharing, collaborative knowledge building and other workplace development activities. But the skills they need to do this may differ from the skills that the learning professional role previously required. Every time I work on the 70:20:10 framework with an organisation I’m reminded of the fundamental role that manager/line leader engagement and capability play in overall success. We know from the Corporate Leadership Council’s Employee Development Survey research into Driving Results Through Employee Development that line leaders who are focused and effective at developing their reports achieve around 25% better performance from their teams than line leaders who are not effective at developing their people. It is essential that senior leadership and line leaders fully understand the implications of this research – that the greatest levers for learning and performance improvement are in the hands of people managers. There is a large number of tools and techniques that are available to make this job easier for managers. These need to be an integral part of any 70:20:10 rollout - from simple techniques to help reflective learning as part of regular manager-report meetings, to guides, templates, tools and tips to support experiential learning and learning through people networks. I wrote about this in my previous blog post (below) ‘Managers and Mad Hatters: Work That Stretches’.